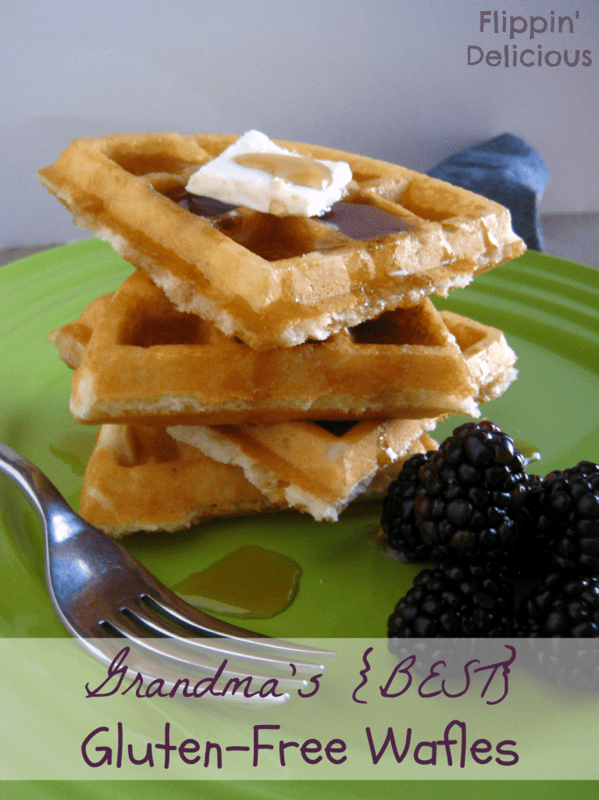 Straight from my celiac grandma, this gluten free waffles recipe is the best! Dairy free waffle option. My grandma makes the very best gluten free waffles. I know EVERYONE says that, but I’m not kidding, it really is the best gluten free waffles recipe. They have the perfectly crisp exterior with a tender bite. My grandmas has celiac disease (we all get it from her side of the family) so of course her waffles are gluten-free. Which is awesome! Growing up, my family ate waffles or pancakes for breakfast every single Saturday. It was a tradition we got from my Grandma. When my mom was a little girl they had waffles for breakfast on Saturday. It was something we could do to feel close to my grandma, even though we lived thousands of miles away from each other. When my family went gluten free (I was a teenager still living at home) I tried dozens of times to make really good gluten free waffles. Waffles that were as good as my gluten-filled days. Every time it wasn’t quite right. They’d be way to dry and crumble all over the place, OR they would be gummy. I don’t know which is worse. I had all but given up, and then a few summers ago while I was visiting my grandma she made us her gluten free waffles for breakfast. Crispy on the outside, a bit fluffy on the inside, flexible and not crumbly or dry at all. They have great texture and great bite. Of course my grandma had nailed a great gluten free waffle recipe. She had been making waffles every Saturday morning for decades. I loved my grandma’s gluten free waffles so much, I asked her for the recipe. She gladly wrote her recipe down for me on a blank 3×5 card from her recipe tin. Sometimes I miss the days of recipe boxes full of index cards. Do you? So much history, and great food. I get to visit my grandma next month and she has promised me lots of gluten free waffles for breakfast! I love that I’ll get to share a little part of my childhood with my own kids. 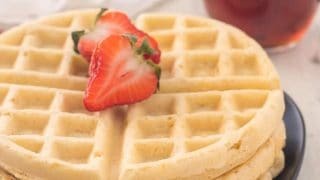 My grandma’s gluten free waffles are really easy to make! 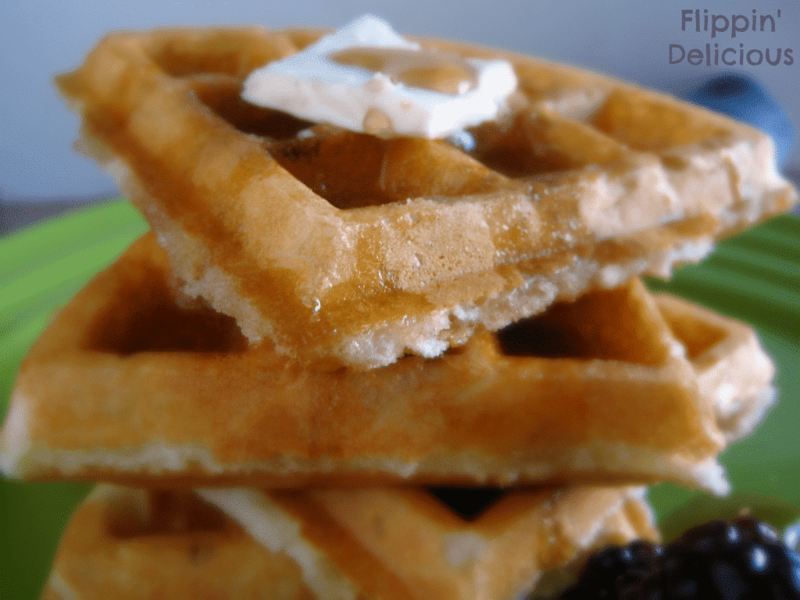 No whipping egg whites or other funky business makes this a very easy gluten free waffle recipe. I can’t whip eggs whites until I’m at least on my second waffle with a half empty mug of coffee. This gluten free waffle batter is quickly whisked together in a bowl or large measuring cup (my fave, it has a spout!) while your waffle iron preheats. I also want a waffle iron that will beep when the waffle is done. My kids will call me over to the kitchen table and I’ll get distracted and forget to go back! Each batch of waffles has at least one “waffle chip” that is too crispy to eat. Occupation hazard as a mom. Don’t skip the sugar. My mom always skipped it when we were kids. She thought, “we are pouring sugar all over our waffles, they don’t need it inside too.” As much as I love her, my mom was wrong. The sugar plays an important part in helping the waffles the brown as they cook. Without the sugar, you’ll have super pale waffles. Measure your flour by scooping it into a measuring cup with a spoon, then swiping off the excess. Don’t scoop the flour directly with the measuring cup, you’ll end up with too much flour. Make sure your baking powder is fresh. 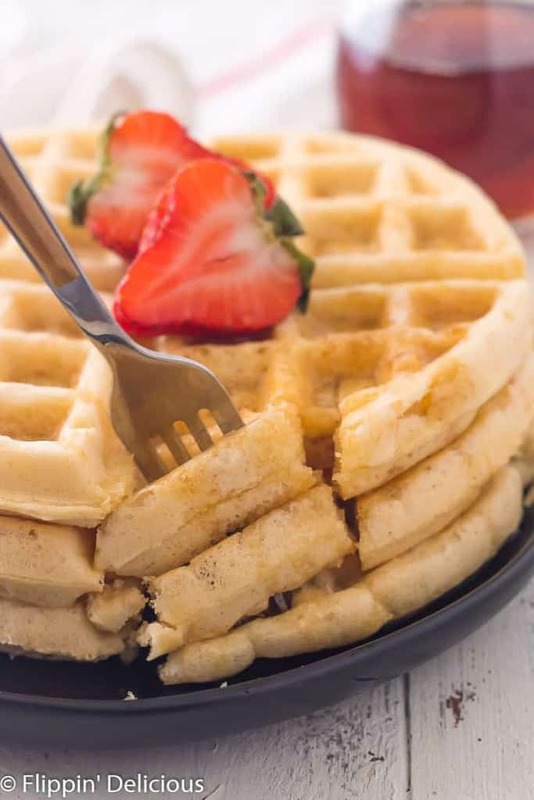 Old baking powder won’t raise your batter as much and you will have dense waffles. Waffle batter thickens as it sits, so you may need to add more milk. I already give a range (1 ½ – 2 cups) because depending on the humidity or where you live, some days you need more milk or less. I always end up using at least 2 cups because I live in the ultra-dry state of New Mexico. You should have a pourable batter that isn’t thin or watery. I like to use a spring-loaded ice cream scoop to measure my waffle batter. It is less messy than using a ladle or measuring cup. I will sometimes mix everything in a large measuring cup with a spout so that I can pour the batter directly onto the iron. 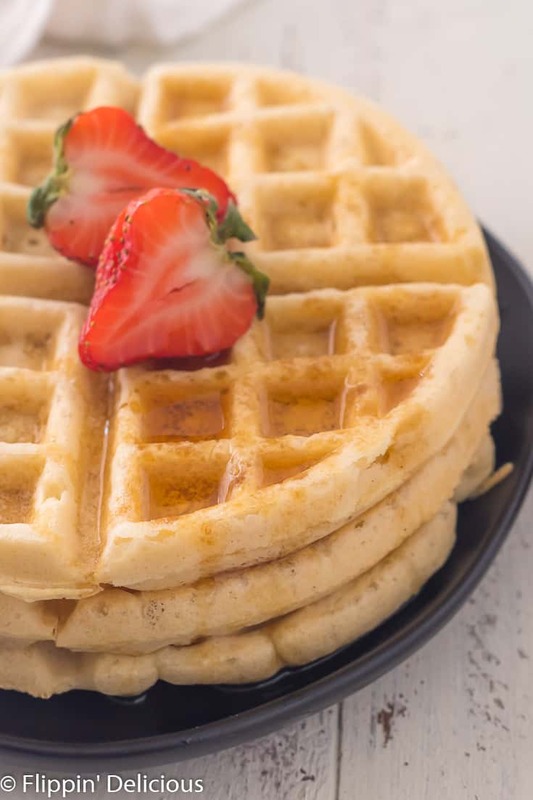 If you are looking for a paleo waffle recipe, I think you’ll fall in love with this recipe for Paleo Sweet Potato Waffles from my friend Natalie over at Perry’s Plate. Have you tried keto? 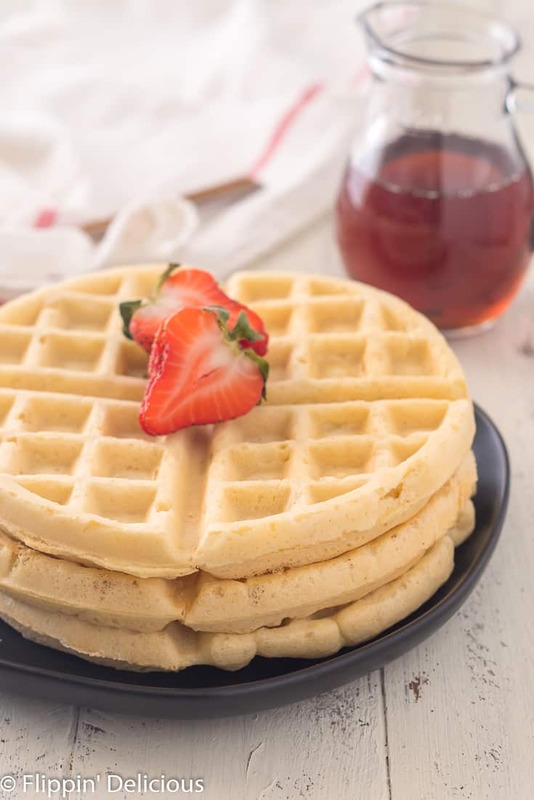 If you need a low carb recipe try these keto paleo almond flour waffles recipe. 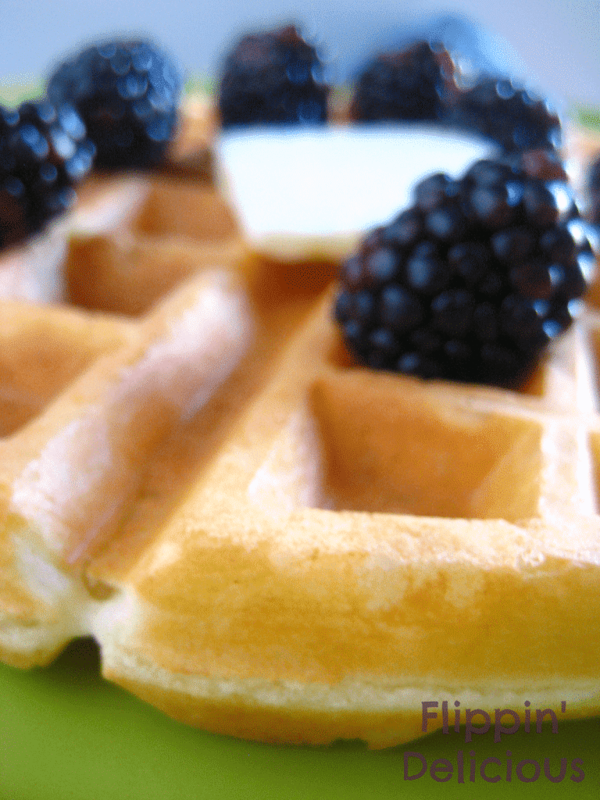 When I have a waffle craving, nothing will satisfy it except for my grandma’s easy gluten free waffles. All they need is a nice pat of butter, a healthy drizzle of real maple syrup, and a few fresh strawberries. Just one bite and I’m sitting at my grandma’s kitchen island, looking through her recipe box as the sun streams through the big bay window in the next room. I love that not only did she pass her recipe on to me, I also get to share it with you. So what are you having for breakfast tomorrow? I’m making waffles! Make a "well" in the middle of the dry ingredients and add the remaining ingredients to the well. Mix together until it is all combined. My waffles took about 4 minutes to cook, and I used 1/3-1/2 cup of batter per waffle, but your waffle iron may be different. A good guideline is to wait until the waffle stops steaming. I've found that gluten-free waffles take a little longer to cook than traditional waffles. “gluten-free rice flour blend” is the same as rice flour? You are welcome to use a different blend, but straight up rice flour won’t work. It will be gritty and won’t work the same. Any good rice flour based gluten-free flour blend should work. What exactly is in her rice flour blend? Any good rice flour based gluten-free flour blend should work, but I like mine best. I use a higher percentage of starches than most other blends and I love how it makes my cakes and cookies soft and not at all gritty, which can happen if your rice flour isn’t finely ground. Can these be successfully frozen and heated later in a toaster or microwave for later? Yes Pam, I’ve found that these waffles freeze very well. I normally throw all my leftover waffles in a ziploc bag once they cool and toss them in the freezer. When I want to eat them I just pop them in the toaster. Is it 1 Tablespoon of Baking powder or 1 teaspoon? I’m making these right now and the first one is rising like crazy! It’s super puffy! Is it supposed to do that? If it over-fills your waffle maker you may just need to use less batter for each waffle. There is a sweet spot that you have to find as to how much batter you should use for each waffle. Because all models are different your waffle maker may need less batter than mine. I better is really thick even with 2 cups milk is that normal? Yes, the batter should be thick, but still pourable. If you feel it is too thick for your waffle iron just add a little more milk, maybe 1/4 cup to get the consistency that you want. 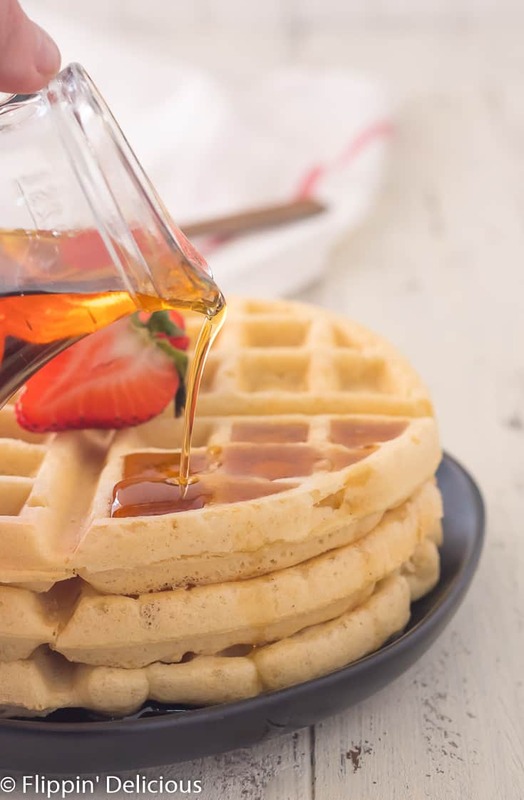 Getting the right consistency for pancake and waffle batter can be tricky because the longer the batter it sits the more it will thicken as the flours absorb the milk. These were delicious! Not quite the texture I was after (I have made a GF crispy, less dense version before… but I couldn’t find the recipe this morning). My husband (known for hating anything GF) ate them and really liked them. I’m so glad that you and your husband enjoyed them! Wow, these baked up so thick they busted the latch off of my waffle iron! My daughter says it was with it though! Very good! They do expand as they bake, that is the baking powder at work! Try using less batter for each waffle. I’ve found that they bust out of my waffle iron when I put too much batter in. It is a tricky balance. Not enough batter and you get holes, but too much batter and you bust off the waffle iron’s latch, like what happened to you. These look wonderful! But the links in the comments to the rice flour blend lead to error pages. 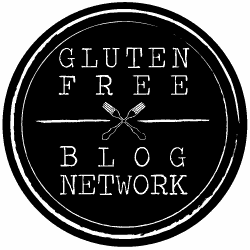 I found a page that claims to have the rice flour blend, but the only blend recipe I find is a cake blend. ( https://flippindelicious.com/gf-supplies-and-flours ) Are they one and the same? Thanks! These are so good! I wouldn’t hesitate to pass these off as regular waffles. I added a splash of vanilla but otherwise followed recipe. I am so happy that you enjoyed them Brittanne! They are my favorite. The splash of vanilla sounds like an excellent addition. Tried the recipe this morning and it’s lovely. Didn’t rise much though but nice a crispy. I am so happy that you enjoyed it, Michael! I tried this waffle recipe this morning. Light, airy, delicious!!! It is going in my fav GF recipe file. Thanks so much. You rock! Thanks Sheree! Grandma’s really do know best. They turn out perfect for me every time! If the flour blend used already has xanthum gum in it, do you still need the additional 3/4 t of xanthum gum? If you are using a different blend that already has xanthan gum you should omit the xanthan gum in the recipe. 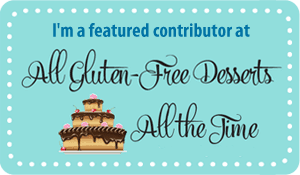 My blend doesn’t have xanthan gum because I prefer to add it to each recipe individually. These look amazing, and I can’t wait to try them! What oil do you use? Canola? Would melted butter work? Can I use powdered sugar instead?